One of my favorite places for sandwiches is Arby’s. I enjoy a good turkey sandwich, quite often actually, because turkey is lean and as a woman <cough> in her forties <cough> I try to watch my weight, as well as increase my protein intake. As a women gets older it is so important to weight train. Which means you need to get plenty of protein in your diet. And one of the easiest ways is lean turkey. I don’t want just any turkey, though. I want freshly sliced hot turkey like that you find at Arby’s. 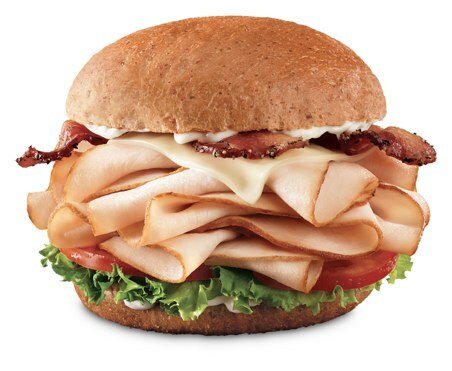 Arby’s Grand Turkey Club is made with freshly sliced, hot roast turkey, melted Swiss Cheese, pepper bacon, leaf lettuce, tomato and mayo all served on a Harvest Wheat bun. Yes, it has bacon on it. Need I say more? Because everything’s better with bacon. You know it’s true. And for a limited time, try Arby’s Grand Turkey Ham Club (at participating restaurants). Arby’s ham is served freshly sliced and hot, too. Yum! My son is quite fond of the Arby’s Grand Turkey Club. He has them hold the tomato and mayo and our local Arby’s is awesome at accommodating his special order. I think he would eat there several times a week. What can I say, he takes after me and has good taste. Seriously, he does appreciate a fresh made sandwich. Not to mention is can eat his weight in curly fries. I know what I’m having for dinner this evening. Really. My husband is picking our son up from school and taking him to Arby’s and I already put my order in for the Grand Turkey Club. Now I just have to wait until they get home with it. Which isn’t easy, since patience is not one of my virtues. I apologize if I now have you craving the Grand Turkey Club, but it really IS that good! Have you tried Arby’s Grand Turkey Club yet? Find an Arby’s near you. That looks good. I”m going to have to try this! I haven’t been to Arby’s in awhile. It might be worth making a stop there soon. Oh I haven’t had Arbys in ages, I’m not the biggest roast beef fan but that sandwich looks really good. I haven’t been to Arby’s in over 15 years, but the sandwich sure does look good though. I have not, we don’t eat at Arby’s often, and when we do I love to eat their Reuben sandwich. I don’t eat at Arby’s too often but that looks like it’s worth a try! This is one of my favorite sandwiches at Arby’s! I have never had anything other than their roast beef. I need to try it. I haven’t eaten Arby’s in quite awhile but I sure did have a thing for their Horsey Sauce while I was pregnant. I really want to try this sandwich. Yum! I have had their roast beef before, but have never tried their turkey. Looks delicious! Yes, now I AM craving this and it’s late Sunday night…Arby’s is closed. 🙁 I definitely want to try it this week though! Oh that looks amazing! I’ve been craving turkey sandwiches but I’m not supposed to have them since I’m pregnant so I may have to wait to try this. My kids love Arby’s and to be honest, so do I. We do not have one near us and have to take a drive to reach one but we do it every so often to get our Arby’s fix. We love Arbys and I didn’t know that they had a new Turkey Sandwich! Of course, my husband is the one who stops on his way home sometimes and grabs us something there, so he never told me that they had it. I have been getting the Reuben sandwich but now have something else to tell him to get! Thanks. We don’t eat at Arby’s much but that sure does look yummy. Uh, yum, that looks amazing! And like a reasonably healthy option too. Too bad we dont have Arbys in Australia.